Home Nightlife Find Your Groove at These Themed Dance Nights Around L.A. Sometimes you just need to let loose on the dance floor. If you’re a slave to the rhythm, hit up these four hot spots where you can turn up and boogie down. Groups of girl friends (and some boy friends, too) turn out in droves for the Echoplex’s monthly homage to women of hip-hop and R&B (free-$15). 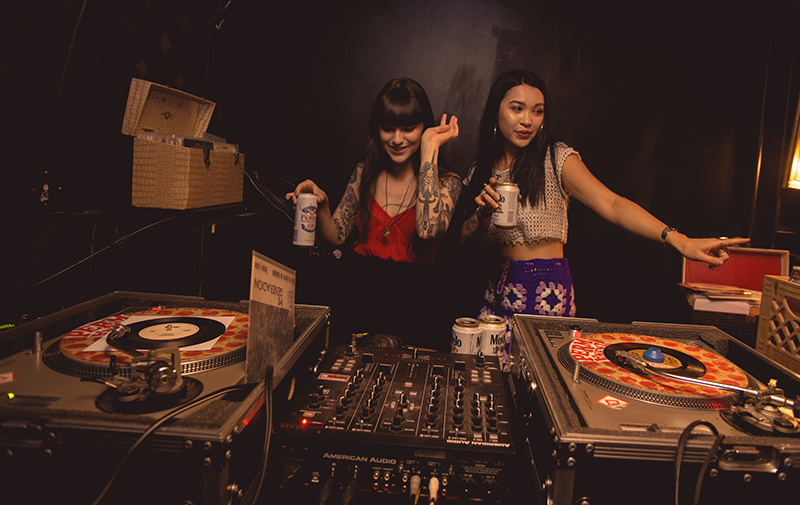 A mostly female crew of DJs spins tunes from the ’80s to today and cultivates a warm, welcoming vibe on the Echo Park dance floor. If you feel the urge to shriek “This is my jam!” over strains of Destiny’s Child, Missy Elliot, and Cardi B, let ’er rip—there’s no shame in it here. Anyone still mourning the loss of soul goddess Sharon Jones should shimmy over to Resident in the Arts District. Host Jackie Jackson, aka the Queen of West Coast Blues, performs live with her band—which has featured players who’ve shared the stage with the likes of James Brown and Marvin Gaye—on the third Friday of every month (free). In between, groove to throwback sets spun by DJs from local label Stones Throw. Groove to ’60s and ’70s psychedelic and surf rock—played mainly off vinyl 45s, of course—at the OffBeat in Highland Park (free). Vintage dress is encouraged at this gig on the second Saturday of each month, and the crowd happily obliges; the spot is usually packed by 11 p.m., when a guest band takes the stage for a short live set. The Schizoponics, Levitation Room, and Creation Factory are only a few retro-inspired rockers who’ve been on recent bills. The long-lost days of Spice Girls, Backstreet Boys, and No Doubt live on at Los Globos in Silver Lake ($10). Each edition of this weekly franchise comes with its own theme (think “Girl Power,” “TRL,” or “Britney & Justin”), and revelers who frequent the Friday event are wont to dress accordingly. The decade’s quirkier and/or more niche artists get some love, too—you’ll occasionally be able to catch a night devoted to Björk or Nine Inch Nails. Next article5 Ways to Ring in the Year of the Dog in L.A.